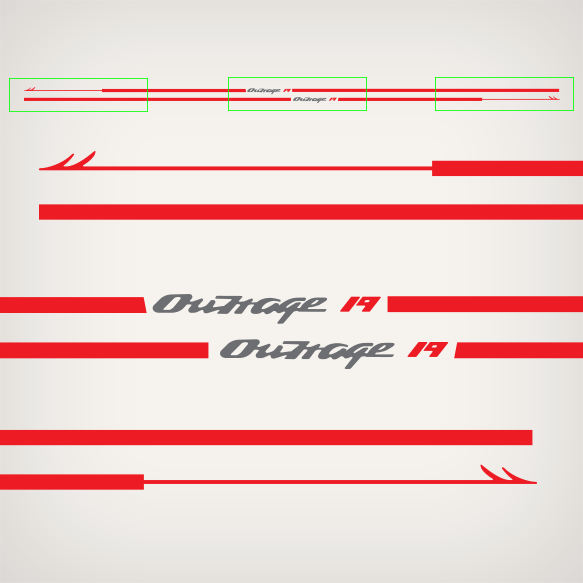 Outrage 19 Harpoon Stripes as seen on 1996 Boston Whaler Boats. Decals are cut on colored vinyl. Based on previous order trends, we recommend to order Boston Whaler Logo size 24"
Overall size is 14.54’ feet (174.50 inches) long aprox. Boston Whaler Outrage 19 boat decals as appears on the image. Overall decal as seen on the upper part of the image. The lower part of the image, is a close up of 3 sections of the decals, showing the harpoon decal pointing opposite sides.